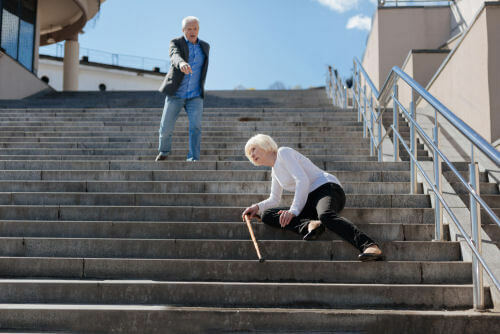 According to the National Council on Aging, falls are common in older adults and are the leading cause of fatal and non-fatal injuries, including broken bones and head injuries. In fact, the majority of hip fractures in people age 65 and older are caused by falls and can have serious consequences, including hospitalization and premature admission to a nursing home. Research has shown that for women ages 70 – 79, breaking a hip doubles the risk of dying within a year. Standardized assessment of fall risk factors and environmental inspection. There are a number of fall risk assessment tools available. The Morse Fall Scale, for instance, is used in hospital settings to identify fall risk factors for patients. STEADI (Stopping Elderly Accidents, Deaths & Injuries) is a comprehensive toolkit developed by the Centers for Disease Control and Prevention. STEADI’s free tools and educational materials help identify adults at low, moderate, and high risk for falls, and offer effective interventions to reduce fall risk. STEADI also provides downloadable brochures for caregivers, family members on fall prevention, home safety checklists, and more. Fall precautions. Simple changes in the person’s environment can reduce fall risk, such as removing tripping hazards, obstacles, and clutter. Many falls at home happen in the kitchen and bathroom, and remedies may include the installation of grab bars near the tub and toilet, non-slip bath mats, adequate lighting and night lights, and stair railings. Sturdy footwear is also important for older adults who are frail or who use mobility aids. Other preventative measures include keeping objects within easy reach, minimizing the use of stairs and ensuring that steps are not broken or uneven. Targeted interventions. It is important for caregivers to understand and address the individual’s physical limitations, such as frailty, unsteady gait, balance and coordination difficulties, confusion, poor vision, and the side effects of medications. The older adult’s healthcare provider may recommend exercises to improve balance and flexibility. Regular vision exams, review of medications that may cause dizziness, and keeping the home environment safe and comfortable may also be part of the person’s care plan. Preventing falls can help older adults stay healthy and live as independently as possible for as long as possible.